Designing a new baby blanket is a lot of fun. I like to customize them specifically for the little one that is going to receive it. I created this one with my little niece in mind — bright colors to catch her eye, soft to the touch but with lots of texture. Normally, I design them in neutral colors in case the mother would like to use it for multiple children, or if the parents do not yet know the gender of the child. Whichever you choose to do, I hope you enjoy making this blanket. I can guarantee the recipient of yours will be just as pleased as my niece will be with the one I made! Do not finish off, continue with border.. Ask me some questions in the comments below! I’m ready to help. 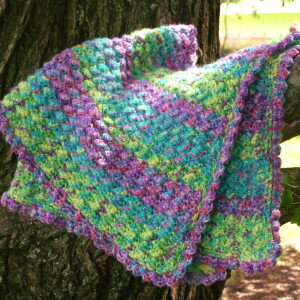 This entry was posted on Thursday, July 2nd, 2015 at 12:00 AM by Amy	and is filed under Free Crochet Patterns. You can follow any responses to this entry through the RSS 2.0 feed. You can skip to the end and leave a response. Pinging is currently not allowed. I love the variegated colors you chose for this blanket. What’s the yarn brand and color names, please? Your colors are beautiful. I want to know the brand and colors, too, please. I’m glad you like my choice! I used Red Heart’s Gumdrop in colors Smoothie, Grape, and Apple. It is the first time I have used them and I think they make wonderful material for a baby blanket! If I wanted to make this afghan, how would I figure how many stitches to add? If you are saying you want to make the blanket bigger, the stitch pattern is a multiple of 3 chains. It says Row 2 – 87, meaning follow these instructions for row 2 through row 87. Does this answer your question? Gorgeous colours. Thanks for instruction on how to make it bigger. The charity I crochet for requires their baby blankets be a minimum of 36 inches square. The babies from the communities who use their services are born with an average birth weight of 10 lbs. and it is very cold there. Thank you for generously sharing your pattern. Best wishes. I cannot figure out how to print this pattern, does anyone know how I can do this. I love it. Hi Nancy! You can use the print function in your internet browser. Depending on the browser you are using, you can click on “File” then “print” in your menu bar. Thank you, Samridhi! I am very pleased that you like the blanket. And that is my intention when I create these patterns, to make something that will remind the child of how much they are loved and last for generations to come. 🙂 Thanks for the comment! Amy, I’m interest in making the Jungle Rhythm Baby Blanket. I love the colors in yours. Please tell me the brand you used and the color number or name. Please reply a soon as you can!! I used Red Hearts Gumdrop in Apple, Grape, and Smoothie. I just want to be sure about instructions for rows 2-87. Should there be a skip 2 sc after every sc, 2 dc Combos? Thanks. Or rather skip 2 chains. Thanks. Please advise. There are both dc and sc in the pattern but the stitch pattern in Rows 2-87 are only worked into sc, thus assuming you will need to skip the next 2 dc. When the pattern says “(sc, 2 dc) in next sc” it is specifying that only the sc are worked into for this stitch pattern. Thank you for treating us to a free pattern. Hey Amy! How many more skeins of each color would I need to crochet this in 36″ x 48″ ? Sorry for the delay! I can’t say exactly because I don’t remember how much yarn I had left over from each color. But an extra skein each would be more than adequate. Thanks Amy! I know I’m coming in on this late, but just found this and really appreciate your reply. My granddaughter turns 2 this coming October and wanted to make this for her in a the 36” x 48” size. I live in the Virgin Islands where there’s only one little craft store that sells a tiny section of yarn, so I can’t just up and go get more yarn if I run out. I already ordered and received the gumdrop yarns in smoothie & grape, but they were out of apple so I got gelato instead which actually looks exactly like apple. I did order 3 skeins of each color. I just started a couple of days ago and it’s already looking beautiful! Very simple to crochet as well! Thanks again for your suggestion about an extra skein and for the free pattern! My pleasure, Ife! I can appreciate the struggle. I too have to rely on ordering my yarn for the most part and it makes planning a little difficult. But I am glad the pattern is working out for you. Let me know if you have any more questions!